With the arrival of a new year, I have been reflecting a lot. I am coming up on the first anniversary of owning the store, soon it will be two years since we moved to the Valley and 2015 has always hovered in the distant future as the year my youngest, Isaac, graduates from high school. And now it’s 2015. Whew! These past couple of years have been a journey and we are still in the midst of it. I’m excited to see what discoveries this year will bring. For now, though, I want to share a winter stew with you. This is one I’ve been making for years and I can’t believe I haven’t shared it yet. While it’s fun to try new recipes, having a repertoire of tried and true staples is important. It’s comforting to create a familiar dish, to slip into the quiet rhythm of cooking and relax. This gives me time to ponder the recurring theme of “how did I get to this stage of parenting so quickly?” while I cube beef and slice onions. 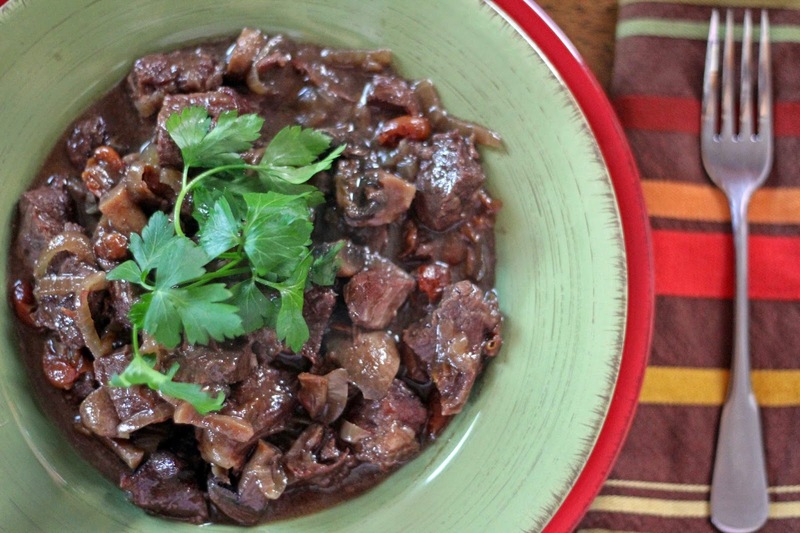 This beef stew is a little different than more traditional stews with potatoes and carrots. 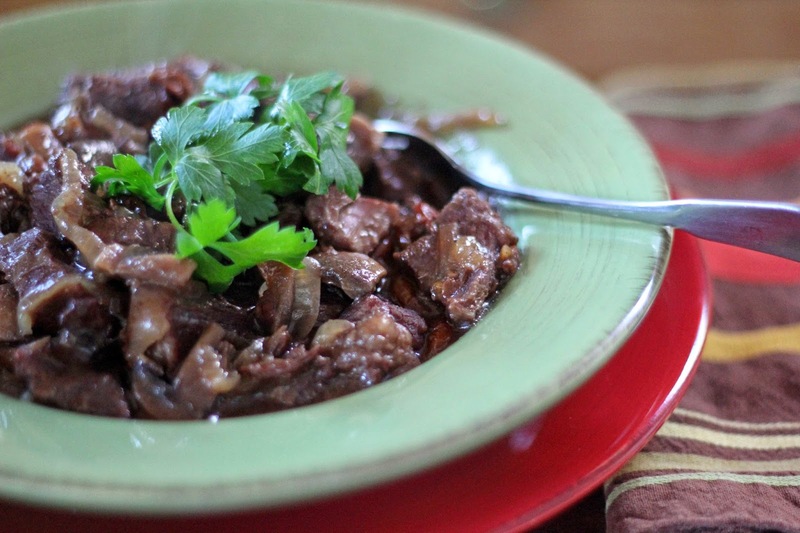 Chunks of beef are simmered in red wine and beef broth along with earthy mushrooms, tart dried cherries, cinnamon and allspice. As the stew cooks, the cozy scent of warm, fragrant spices fills the kitchen. Recently I learned about making beef bone broth and what a revelation! Instead of cooking the bones for an hour or two as I had done in the past, the bones are first roasted and then simmered for twelve to eighteen hours, yielding the richest, most nutrient-dense broth possible. After chilling the broth, I skim the fat and save it for cooking and then freeze the broth in jars. If you have access to homemade bone broth, please use it in this stew. After cooking for a few hours, the beef is meltingly tender and it’s hard to stop taking little tastes. Like most stews, the flavor improves as it sits and is even better if you prepare it a day ahead (making it a terrific dish for guests). I find that cooking and eating a familiar dish like this one grounds me and is a constant during this time of transition. I’m happy to settle in with a savory bowl and just be. Preheat the oven to 350 degrees. 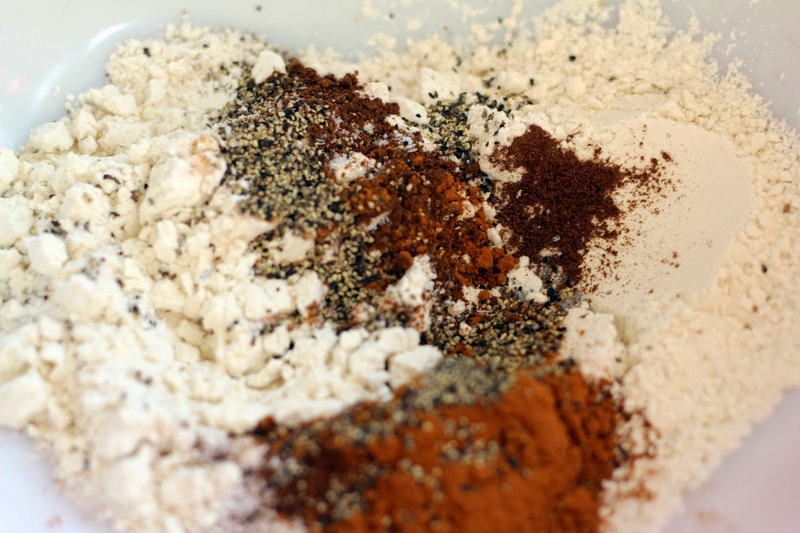 Combine the flour, salt, allspice, cinnamon and pepper in a large bowl and stir to combine. Add the beef cubes and gently toss to coat them. Add a tablespoon of fat or oil to a Dutch oven and heat it over medium-high heat. Add a 1/3 of the beef and brown it on all sides (about 5 minutes). Remove it to a large bowl and repeat with the remaining meat in two batches, adding a tablespoon of oil each time. Reduce the heat, add the remaining oil, onions and cherries. Cook until the onions are soft and beginning to brown. 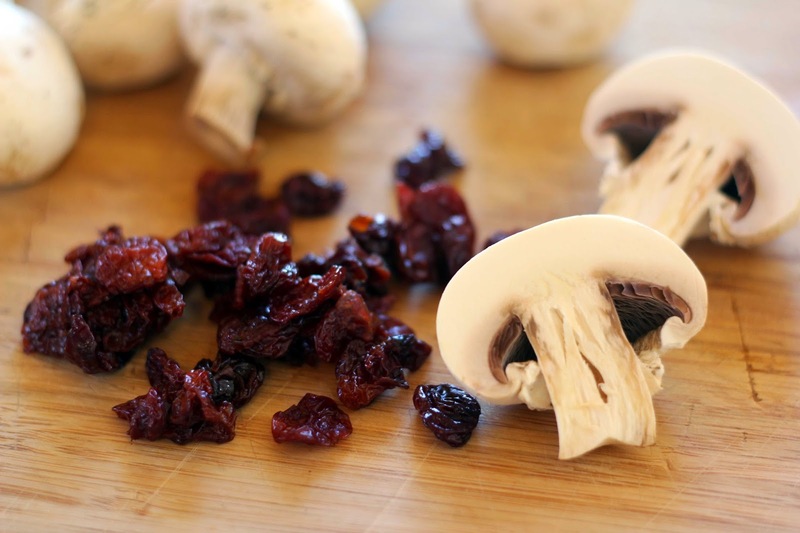 Stir often and mix in the sugar, vinegar, wine, broth and mushrooms. 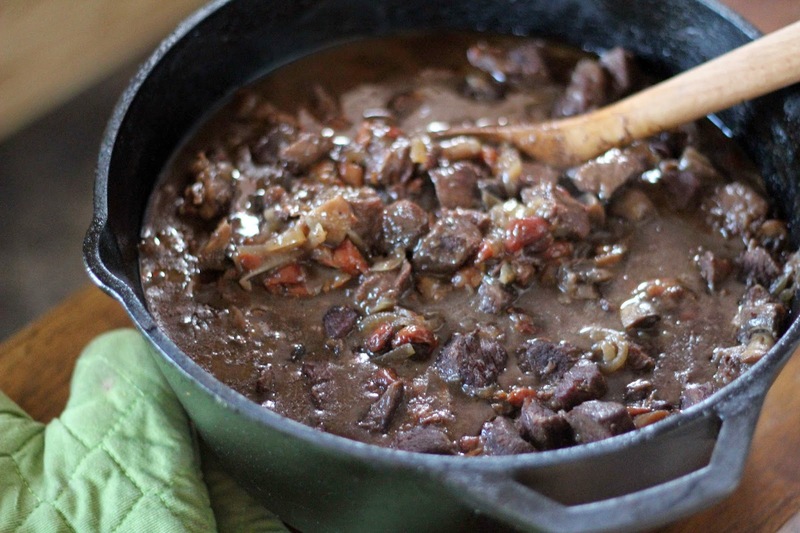 Return the beef to the Dutch oven and mix everything together. Cover the Dutch oven and bake for 2 ½ hours, until the beef is very tender. Remove the lid and bake for 15 minutes to thicken the stew a little. If it seems a bit dry you can add a bit of broth or red wine, but I haven’t had this happen. 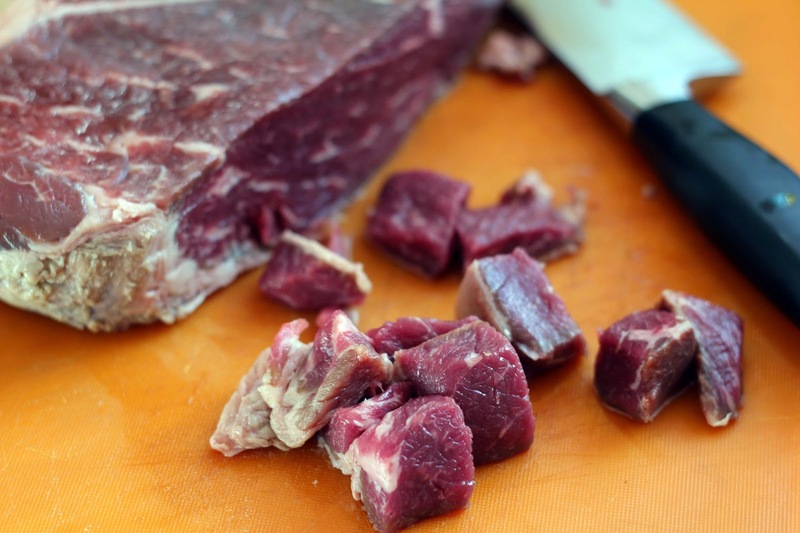 Using a wooden spoon, gently mash some of the beef chunks against the side of the pan and stir in. Taste for salt and set aside to cool. If serving that day, you can reheat the stew covered in the oven or over low heat on the stove top. Or, cover and refrigerate it until ready to serve. Reheat it (covered) in a low oven or on low heat on the stove top.